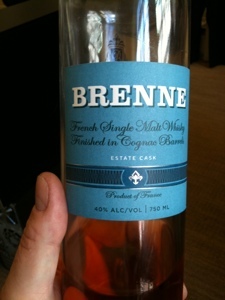 The Coopered Tot: Brenne: Single Malt Made In Cognac. Brenne presents an effusively sweet floral nose and a delicious flavor profile with an up front candied apricot-citrus presentation. It's a success, and proves to be the benchmark of a unique Cognac malt whisky flavor profile that is worth seeking out. But the real story here is the craft distiller that makes it - part of a tradition that connects a medieval past with the latest trends in distilling, and the importer who has created the brand who also represents something new with the power to disrupt the old order. The blogosphere is gearing up for the global launch of Brenne single cask single malt from Cognac, France on October 1, 2012. But sales on Caskers actually began Friday 9/28/12. [Caskers sells items for limited times. 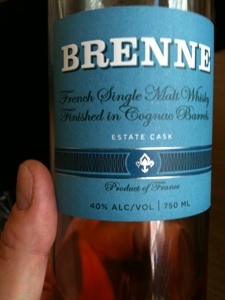 To see where to get Brenne now you can look at: http://drinkbrenne.com/buy ] This will be France's Cognac region's first single malt whisky. It is crafted from two different varieties of organic barley grown on the same farm where it is mashed, distilled, barrel aged, and bottled. "Farm" isn't the right word. It's a vineyard dedicated to the production of Cognac brandy - and has been so for many generations. Centuries ago the winemakers toiling in the poor mineral soils of the region discovered that the thin and rather sour white wine they made formed an excellent basis for distillation and the eau de vie they produced took barrel aging exceedingly well. It produced one of the world's greatest spirits. While large vineyards with their own brands of Cognac exist (Frapin, for example), most of the Cognac we consume is produced by smaller anonymous vineyards, like the maker of Brenne, who sell the entirety of their distillate to large well branded blenders like Remy Martin, Couvoisier, Camus, and Martel. These brands, like the great whisky blend brands, famously age and vat dozens of different component distillates to produce their signature flavor profiles. Allison Patel of Local Infusions, who created the Brenne brand, found one such traditional family owned Cognac producer who had been experimenting with growing and distilling malt. Perhaps he is a whisky lover himself? Patel reports that he had been producing malt whisky initially for his own enjoyment. Perhaps he was influenced by the recent rise of malt whisky production in France, part of a world-wide craft distilling movement. The Cognac region is not ethnically Celtic, like Brittany's Amorican Penninsula - where malt beverages like beer and malt whisky are arguably part of an ancient and at least partly British cultural heritage. Breton malt whiskies such as Amorik and Kornog have been exciting whisky lovers and earning rave reviews for getting on a decade now. Though not Celtic, distilling in Cognac is traditional and Brenne is produced by distillers with generations of experience producing good liquor. Thus Brenne is produced by being double distilled on Alembic pot stills in the manner of Cognac. Brenne is not the first malt whisky produced in the Cognac region although it is the first single malt. Last year Palm Bay began importing a 5 year old blended whisky made of malt and wheat spirits called "Bastille 1789" (read my full review from May). Bastille is young, and tastes young. And it's a blend and it tastes like a blend. Indeed the medicinal spirit heat and low density of flavor - common attributes of young blends - were my principal complaints. However there were some novel attributes to its flavor profile that were alluring enough for me to recommend it. There is a unique wood management story with acacia, cherry, and french oak which puts some Asian spice notes in. But ultimately its principal allure is the palate, dominated by an apricot citrus note that is fruity, fresh and pretty original. Color: gold with coppery amber tints. Nose: Intensely floral at first: roses, lilies, and magnolia. Then sweet and fruit: candy orange-cream, hint of banana, apricot, sweetened whipped cream. Palate entry: milk and white chocolate with orange apricot cream. There is the brightness of citric acid at the mid palate expansion. Gentle soft mouth feel is light, but still silky. Surprisingly little oak presence given 5 years in new oak, but rather some grapefruit astringency at the turn. The finish has whispy vanilla, creamy candy afterglow and a warm herbal glow. There are some hints of the spicy heat I was expecting given the French oak barrel aging - but much less than I was expecting. This isn't spicy or hot. Just rich, packed with flavor, and yet light, silky, soft, and incredibly smooth. Just lovely. Feminine, gentle, flowery and sprightly fruity in a way that is unique and, as it turns out characteristically French. Nose: similar but thinner, sharper, and with more spice. Medicinal spirit heat more in evidence. Fruits: apricot cream and spices: hints of curry and cumin spices. Some grainy burn. See the link to my full review for more detailed notes. Creamy entry- more heat and spice. More medicinal heat and grainy alcohol. But, strikingly the major aspect of the flavor profile - an orange/apricot flavor note is clearly in evidence. Brenne and Bastille are clearly kin in that they share a floral orange apricot flavor profile, but Brenne is a more refined product, sweeter, richer, and clearly more mature. Bastille remains an interesting 3 star. Brenne shows a dramatically floral nose (my first comment on smelling it was "Laddie 10!" - high praise) and a cohesive creaminess and orange candy palate that mark it as the new hallmark for the Cognac flavor profile. It's a 4 star product now, and it's still young at 7 years. I'll be very curious to see if older expressions build on these considerable strengths in future years. Brenne's light and floral nature, combined with the fact that the importer is a woman who likes to employ women on the project and has chosen a feminine design (ie a bright blue label) will lead Brenne to be called a "feminine" whisky. Maybe one well suited to women whisky drinkers. Given that I already used the word "feminine" in my tasting notes I concede it makes me a bit of a hypocrite to proclaim that I don't believe there is such a thing as a "female palate preference". Women, in my experience, like robust peated malts just as much as gentle lacy ones. I think it's a case of different flavors for different moods. I'll take a peat bomb on a dark and stormy night and a light and fruity dram on a warm summer day, or vice versa as the mood hits me. Brenne is squarely in that light and lacy end of the spectrum, but isn't overly light or immature like many of the whiskies in this end of the flavor gamut. What makes it "feminine" is that the flavor signature is so floral and distinctly sunny with its bright happy citrus and hard candy notes. It's a gourmet whisky. It's a meticulously hand crafted craft whisky. It's organic field to bottle. Single cask, unfiltered and uncolored. That's a lot of buzz words that suggest a quality story. The story entertains in the telling however. This weekend I found myself in a lodge on a retreat with hundreds of Dads from my community. Predictably I was in a corner with a half dozen whisky enthusiasts and the 10 or so samples I happened to have on hand (and a few the other Dads had brought). We sampled a wide range from high end Bourbons to top notch Scotches (including Octomore 2.1, Smooth Ambler Very Old Scout, Miltonduff 15, Oban DE 1995, etc..). In this raucous session Brenne did more than hold its own. It fairly stole the show. Part of the appeal was the interest of the "single malt from Cognac" story - but the biggest part was that big floral candy orange white chocolate flavor explosion. Some of comments were: "Delicious." "Rich, yet soft and gentle." "Unique". At 40% abv. Brenne was the lowest proof item in the whole session - but it didn't fade into the background. In fact it stood out. 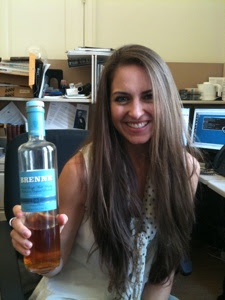 Brenne is a high end whisky that is as soft and gentle and pretty as any in my experience. It's approachable and accessible in a way few malts are. It dances on your tongue like a pretty maiden in a gauzy dress with flowers in her hair. I really enjoyed everything about this review. Like you, I found the Bastille pleasant enough, but lacking. The Brenne sounds quite lovely, and I look forward to tasting it. Thanks for bringing it to my attention! Joshua Luke - thanks so much. It looks like you guys in the Orange County Scotch Club have a good time! Brenne is a lot like what you might imagine Bastille to be like as a single malt - but there are differences in the barrel management and a host of smaller differences too. It's hard not to lump them together given the common region at the orange-apricot flavor notes. 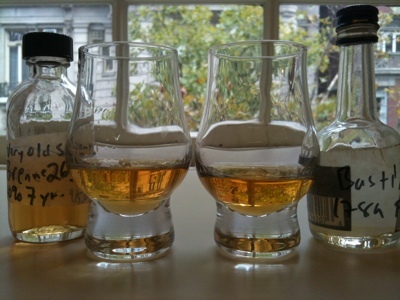 Truth be told most Highland & Spey whiskies aged in ex-bourbon casks have common flavor elements too (floral & white or green fruits) and we don't necessarily lump them together - even though they can be hard to tell apart blind. Anyway - both Bastille and Brenne are examples of a new organism in the whisky ecosystem: the Cognac malt. Brenne is a higher order product all around and something really quite exciting. I'm hoping it becomes a trend. I thoroughly enjoyed the Bastille, but this sounds pretty amazing...I'll be keeping an eye out...my short list is getting kind of long, especially since I've been exploring American brandies lately. Too many drams, not enough time =) Great review! If you like Bastille for the orange-apricot thing you'll be in 7th heaven with Brenne. It amps that flavor signature much higher and with more body and richness on the palate. However if you were digging the asian spice thing coming from the Acacia & Cherry woods with Bastille, be aware that that particular angle isn't going on with Brenne. Brenne takes the French oak angle further - with the 5 years in new charred Limousine oak and 2 more years in ex-Cognac refill Limousine oak casks. All that spicy French oak shows up with some tannin & filigree in Brenne - but it stops short of "spicy". Very cool about American brandies. Blog them. I'm quite interested. What are some you've tried lately? Have you tried G-R XO?